The Bible addresses weariness, and in its simplest form, we know that a weary body needs rest and nourishment, just as a weary spirit does. There are numerous examples in Scripture of exhausted believers seeking bread and water - both natural and spiritual - to sustain them. They serve as examples to us of how to overcome our own exhaustion. As is so often the case, one way leads to the bread of adversity and the water of affliction (see Isaiah 30:15-21, especially v. 20), and the other leads to the bread of life and to living water. Exhaustion itself is not a sin. God has a special place in His heart for those who are weary, and He does not "break a bruised reed." (Isaiah 42:3). In other words, He is all about lifting up those who are oppressed and giving rest to those who are tired. His ways are along paths of stillness and refreshment (Psalm 23). It is the enemy who is the taskmaster, the driven one who pushes us beyond our limits. In Old Testament stories, this enemy often shows up as an Amalekite. The Amalekites symbolize the first cause of exhaustion: warfare. The Amalekites were the "valley-dwellers," as their name implies. They are the ones who attacked Israel's weaker, rear flanks at Rephidim when Moses led Israel out of Egypt. (Deuteronomy 25).They attacked Israel again at Ziklag, kidnapping defenseless women and children and burning the city. (1 Samuel 30). They aligned themselves with the Midianites (whom Gideon fought) against Israel. And it is widely believed that Haman was a descendant of Amalek as well. The Amalekites liked to hit Israel when they were down. They didn't play fair. For this, they earned God's eternal displeasure, voiced in Balaam's fourth oracle: "Amalek was first among the nations, but its end is utter destruction." (Numbers 24:20). Despite the command for Israel to blot the Amalekites out completely, God indicates that He will have war with Amalek from generation to generation. 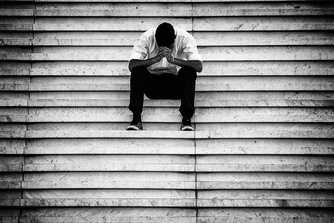 The second cause of exhaustion is sorrow or grief. When the Amalekites destroyed Ziklag, carrying off Israel's wives and children, David's men "lifted up their voices and wept, until they had no more power to weep." David was "greatly distressed, for the people spoke of stoning him, because the soul of all the people was grieved, every man for his sons and his daughters." (1 Samuel 30:4-6). In fact, when David went up to recapture the women and children, 200 of his 600 men stayed behind, because they "were so weary that they could not cross the Brook Besor." (1 Samuel 30:10). The name Besor may derive from the Hebrew "basar," which means "cheerful," or "cool." They were undoubtedly in need of some cheering up. 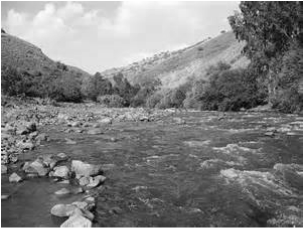 Now, I don't know how wide this brook was at the time, but it is not mentioned as a "raging river" or a great "Red Sea," which should give you an idea of just how tired these men were from their grieving. It shouldn't be terribly difficult to cross a "brook" - unless you are truly exhausted. Jesus' disciples faced a similar type of exhaustion. After being told that their superhuman leader was about to die, they could not even pray with Him at Gethsemane. The reason? A crisis of faith that found them "sleeping from sorrow." (Luke 22:45). A third type of exhaustion is that which results from intense spiritual activity. Daniel fell sick and faint after a significant encounter with an angel in Daniel 8. Elijah ended up in a cave after a long journey and a massive victory against 400 prophets of Baal. Moses needed support to hold his hands up in a prayer-battle, and counsel from his father-in-law to delegate his responsibilities. Jesus often told the disciples to "come away and rest" after times of ministry. Sometimes, successes lead to exhaustion, too. No one is exempt. ​We know, of course, that we are exhausted. We feel it deep within our bones. We want to sleep, to stop all the motion and commotion. We crave peace and nourishment but it doesn't come. If we haven't crashed by our own "Brook Besor" yet, we begin looking for help, creating solutions we think will solve the problem. Unfortunately, they don't always work. Gideon's starving army was denied bread twice, first by the men of Succoth (meaning "tents/tabernacles"), and then by the men of Penuel (which means, "the face of God.") How symbolic; they were seeking bread that only God could supply; man's help turned out to be useless! Elijah had to be fed bread and water by an angel to regain his strength. The disciples slept until Jesus wakened them and told them to "arise and pray, lest you enter into temptation." (Luke 22:46). Esau sold his birthright to Jacob for a bowl of soup because he was so weary. He regretted it later. Only David did the prudent thing by seeking the face of the Lord in his weariness. In the midst of a burning, desolate city when his men were blaming him entirely for their losses, David sought the priest's ephod and inquired of God as to what should be done. Not surprisingly, God said "Pursue, for you shall surely overtake them and without fail recover all." (1 Samuel 30:8) Remember, God wants us to have a decisive victory over the Amalekites! But the ones who defeat this particular enemy are those who, like David and Moses, work their strategies in partnership with God. There is no remedy for physical exhaustion except rest and nourishment. What these Bible stories illustrate is that the remedy for soul-exhaustion can only be found in Jesus. 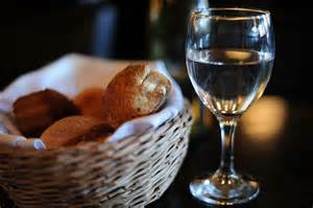 He is the Bread of Life, and His Word is the Living Water that refreshes from within. "Come to me, all you who labor and are heavy laden, and I will give you rest. Take My yoke upon you and learn from Me, for I am gentle and lowly in heart, and you will find rest for your souls." (Matthew 11:28-29). Immediately after David prayed at Ziklag, a famished Egyptian man was found in a nearby field. He was an Amalekite servant who had not eaten for three days. Why? Because true to form, when the servant fell sick, his Amalekite master left him behind. The calling-card of an Amalekite is a sick and weary servant! It was the previously-weary David, now fresh from prayer and full of the compassion of the Lord, who gave this Egyptian the bread of life and the water that restored him. That same servant then led David to the Amalekite troops, where David's men recaptured all that had been stolen. Jesus guarantees that we will recapture our strength as we enter into His Presence. It does seem contradictory to stop and locate that place of stillness with Him daily, when there is so much that needs to be done! Won't we lose our battles if we stop fighting? Aren't we becoming lazy, or too "soft," when we choose intimacy over activity? It's an enigma. No matter how exhausted we feel, WE are told to arise and blot out the Amalekites who weary us. Yet it is GOD who promises to wage war against them from generation to generation. The solution to this enigma is partnership. Allow me to rephrase God's words to David as our answer for today: "Pursue ME, for you shall surely overtake them and without fail recover all." c. Deborah Perkins/ His Inscriptions. All references NKJV.